Citation Information: J Clin Invest. 2015;125(12):4666-4680. https://doi.org/10.1172/JCI83024. 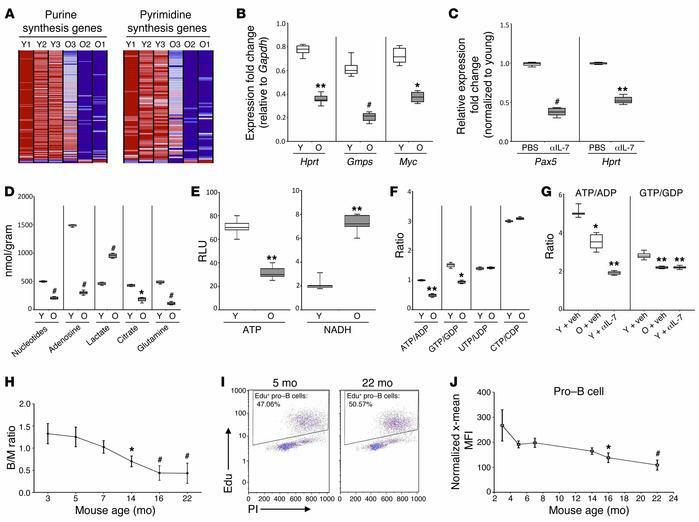 Impaired metabolism, nucleotide anabolism, and cell cycling accompany aging B lymphopoiesis. (A) Nucleotide synthesis GSEA sets were derived from microarray analysis of B progenitors isolated from young and old BALB/c mice. Y1, young mouse #1; O1, old mouse #1. (B) Hprt, Gmps, and Myc expression in sorted young and old pro–B cells was determined using qPCR. Values represent the mean ± SEM of 4 independent experiments (8 donor mice/age group). (C) Young BALB/c mice were injected with 1× PBS or IL-7–neutralizing Abs (αIL-7) every 4 days for 2 weeks, and Pax5 and Hprt expression was determined by qPCR in B220-purified B progenitors. Values represent the mean ± SEM of 3 independent experiments (6 mice/age group). (D) B progenitors were isolated from young and old BALB/c mice, and NMR metabolomics was performed. Values represent the mean ± SEM of 2 independent experiments (8 donor mice/age group). (E) ATP and NADH levels were determined in B progenitors isolated from young and old BALB/c mice. Values represent the mean ± SEM of 3 independent experiments (9 donor mice/age group). (F) Samples used in D were analyzed by mass spectrometry for relative nucleotide levels. (G) Young and old BALB/c mice were treated with 1× PBS (Veh. ), or young mice were treated with IL-7–neutralizing Abs as described in C, and the energy balance of purine nucleotides in B220+ cells was determined by mass spectrometry. Values represent the mean ± SEM of 3 independent experiments (4 donor mice/group). (H–J) C57BL/6 mice were injected with EdU, BM was harvested 2 hours later, and cell-cycle analysis in pro–B cells was performed. (H) B220+/MAC1+ (B/M) cell ratio. (I) Representative cell-cycle profiles. (J) Normalized x-mean MFI of EdU+ cell populations for pro–B cells. Statistical analyses in H and J are relative to the levels observed in 5-month-old mice and represent the mean ± SEM of 3 independent experiments (4 donor mice/age group). *P < 0.05, **P < 0.01, and #P < 0.001, by Student’s t test relative to young controls for each experiment. Y, young; O, old.